The Kickstarter for the Battlestar Galactica-themed sci-fi strategy game XO wraps up in a couple days, and for anyone waiting to see how it fared before committing to backing it, it has been successfully funded. Now the developers are pushing toward a couple of stretch goals, including epidemics, sub-missions, and boss fights. I had a chance to futz around with a pre-alpha build of the game that included a quick rundown of its political simulator, and even at this very early stage it's those human interactions that promise to be the game's real strength. Each ship in the fleet has a captain and crew, some or all of whom may opt to actively provide assistance or cause trouble. Military ships are generally ready to follow the chain of command, but civilians, who aren't quite so well steeped in a "do what you're told" culture, tend to be more troublesome. And it doesn't look like idealism will be the recipe for success: In the demo, I discovered a dissident on board a new ship, threw him in the brig, and when that angered other members of the crew I applied pressure—"counseled" them—to keep them in line. "In XO, civilian refugees are thrown together in close quarters with the military. Even in ordinary circumstances, this results in friction. Now add an all out war that humanity is losing and you get a situation that will explode unless managed carefully," Jumpdrive Studios founder and Creative Director Brian Jamison explained. "So what happens when people turn unfriendly? If they are in control of a resource on a ship (say, food distribution), they will withhold the resource and make demands. You'll be forced to take an action—or innocent people will die. If the captain of a ship becomes unfriendly, it might disobey orders or abandon the fleet." 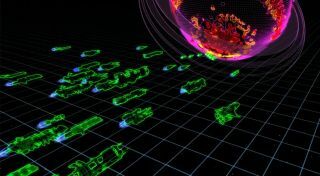 The political element of the game is being modeled in part on "cyber-terror alert systems," similar to the NICT Daedalus system seen here. Jamison said he didn't anticipate taking the game in that direction, but "people absolutely lit up when we talked about the possibilities" of the political simulation, and so the team began to expand the focus on politics and human interactions. "Dominic's [Technical Director Dominic Mandy] scientific research experience led him to some papers on how human interactions work based on how the United States government tracks terrorist networks and identifies who is the leader," Jamison said. "He was struck with what a perfect fit it would be for modeling the interactions between people in XO." It's very rudimentary at this point but Jumpdrive is clearly aiming to achieve something deeper than just a pretty space-borne RTS. In fact, combat and resource gathering are almost entirely automated, and only the high-level decisions—fleet formation, which distress calls to answer or ignore, when to stop scooping fuel and bug out—ended up on my table. It gave me a real feeling of being in charge, a distinct and very nice change from having to tell my individual lackeys which trees to chop down. All that could change between now and release, of course, and there's a long way to go before its potential is met, but I am optimistic—with all the usual cautions and caveats applied. The XO Kickstarter will finish at 9 pd EDT on August 19. Find out more at Jmpdrv.com.